Pectin. No Sugar Pectin. Ball. Certo. SureJel. Pomona. Pectin Jaune. Confusing, right? Let’s talk pectin. What follows is strictly my opinion and reflects my own experiences with various commercial pectins. I am not endorsing or dismissing any of these products. They are all effective and useful. Choose the pectin, or no pectin, according to your own expectations and desires. Pectin is necessary to build a gel for preserves, to suspend the fruit in a syrup. All fruit has some pectin, but some fruits have a lot of pectin and others have hardly any. Apples, citrus, gooseberries all have loads of natural pectin, while most stone fruits (cherries, apricots, peaches and plums) do not. Consequently, making apple jam or marmalade that sets up is a relatively easy thing, while cherry jam, strawberry preserves and plum jelly can be difficult. Here’s a factoid I just learned from Wikipedia “In human digestion, pectin binds to cholesterol in the gastrointestinal tract and slows glucose absorption by trapping carbohydrates. Pectin is thus a soluble dietary fiber.” Eat More Fruit Preserves! Commercial pectins are made from citrus peels, for the most part, and occasionally from apple cores and peels. Certo and SureJel, the pectins commonly found on your grocer’s shelves, have been around for decades. These are the gelling agents your mother and grandmother turned to when jam was on the stove. These commercial pectins are formulated to work with ratios of fruit to sugar that are high, in many cases a pound for pound equivalency is necessary. That’s a lot of sugar. But it’s also the flavor we grew up tasting. With these pectins, the number of jars of jam produced from a pound of fruit – the yield – is higher than when no pectin is used. As the public began to demand lower sugar alternatives, the no-sugar version of these commercial pectins became available. These no-sugar, or low-sugar alternatives use fruit juice (generally apple or white grape) to make up for the lower sugar, and in my opinion change the flavor from pure cherry or pure plum to one that has tones of apple or grape. Not a bad thing, just not what I am looking for in my preserves. 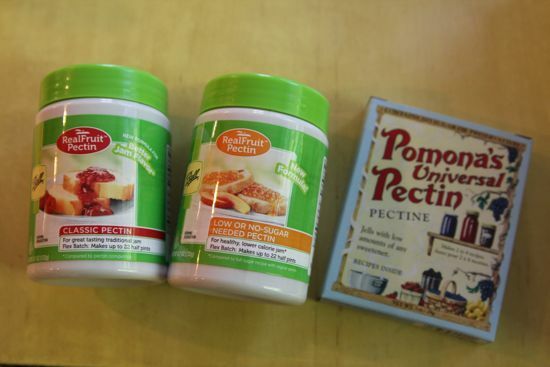 Recently, Pomona Pectin began to attract attention. Pomona resembles the pectin most widely used in Europe – Pectin Jaune. This product can be used with no sugar, low sugar, and sugar substitutes. For many people, particularly diabetics, this pectin is a superb choice. I’ve used it for jellies and jams, but for me, I was disappointed in the often cloudy appearance of the end product. Ball (the jar company) has recently begun to package their pectins – both traditional and low sugar versions – in small, convenient plastic bottles, available wherever you buy jars. Their website is comprehensive, has answers to many frequently asked questions, and has wonderful tools to respond to questions about pectin use, including a pectin calculator. If you’ve been reading along here, you know that I’ve made homemade gooseberry and apple pectins. In fact, I’m starting a batch of apple pectin today with fifteen pounds of green, unripe apples brought to me by Susan Behl of Nob Hill Farm. She’s my favorite enabler, growing gorgeous fruits like gooseberries and white, red and black currants; mirabelle plums, a staggering variety of peaches and raspberries, dozens of apple types, and even walnuts! If you’re in DC, you’ll find Susan at the Lafayette Farmers Market and the Palisades Market. I put up four ounce jars of these homemade pectins to use in recipes using three pounds of fruit and three cups of sugar. Beware, they are less precise than commercial versions. Some years, the pectin is strong and gels right away, other times it takes a few minutes of evaporation and boiling to get the set right, but in all cases, I am able to keep the sugar to fruit ratio consistent, and the flavor of the fruit is what I taste, not gooseberry, not apple, and not sugar. Remember that some preserves and jellies can take up to a month to fully set up, so don’t rush to any conclusions, and as I often say, if your jam or jelly doesn’t set, just call it syrup and enjoy it over pancakes or stirred into seltzer. I made a lovely cherry preserves using some of the tart cherries I scrounged this season – they were so hard to find! I have also tried my gooseberry pectin with peaches and with apricots (same ratios) and have had superb luck – recipes coming soon. I hope you’ll give it a try, too, and let me know how you do. It’s time to celebrate! July 14th is Can-It-Forward day. This is the third year this wonderful celebration of canning will be held. 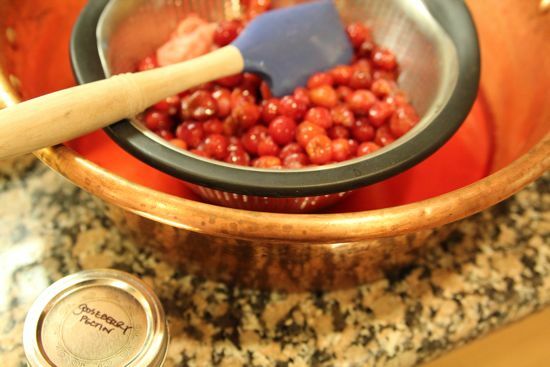 Why not hold a canning party in your home? 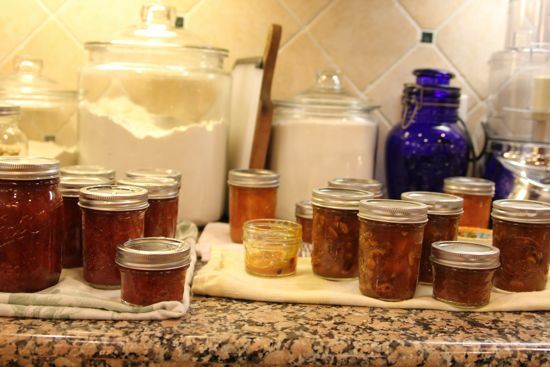 Teach some of your friends and neighbors about the ancient art of preserving. You’ll find lots of information on the Ball site, and as they’ve partnered with Food52 this year, there’s even more inspiration on my favorite food site and chances to win product and join others canning across the country. Don’t miss the excellent advice and information at Canvolution’s site, and check the Twitter hashtag #canvolution to see what all the brilliant canners across the country are up to. The Can-A-Rama will be held July 20-22, so if you miss the 14th, there’s another chance to party with your jars one week later. Pit and stem the cherries over a bowl, capturing all the juices. Collect about 1/2 cup of the pits and rap them with a hammer to crack. Wrap the pits in cheesecloth and tie well. Add the pits, sugar and lemon juice to the bowl of cherries and stir well. Allow the mixture to macerate 8-12 hours in the refrigerator, covered. Set a strainer over a heavy bottomed pot and strain out the fruit. Dispose of the cheesecloth bag of cherry pits. Bring the collected juices to a full rolling boil, stirring often, until the temperature reaches 220°. Add the fruit and bring the mixture back to a full rolling boil, then add the pectin. Bring everything to a good hard boil. The foam should dissipate, but if any remains, add a pinch of butter and stir well. Turn off the heat and check the set by pushing at the surface of the preserves. If it wrinkles, you’re all ready to put the preserves in jars. Another test for its readiness? The fruit will not be floating, but will be suspended throughout the syrup. If it’s still loose, boil for another two to three minutes and check the set again. Ladle the hot preserves into warm jars leaving 1/4″ headspace. Process for ten minutes in a waterbath. I’m not sure if I’m the Laura referred to in your PS, Cathy, but if not you are prescient. I have never done home-canning and I am itching to try it. I’ve been buying more farmers market jams and fewer from the store over the past few years. Now I’ve decided that it would be fun to buy the fruit rather than the jam and to try canning myself. After I met several people (beginning with you) who do their own canning, I got my nerve up, so I’m ready to begin. With all the great info in this post and these resources, I can even satisfy my urge to know the reasons behind what I’m doing and alternative methods of setting. Many thanks. Actually a different Laura, but happy to inform any Laura! Time to get canning – just give it a try! Such an informative post, Cathy. Very excited to continue my canning education! Thanks, Carol. It’s stone fruit season, so it seemed the right time. Cathy, I really appreciate your views on pectins. I’ve not tried Pomona yet but I’ve heard from people who love it. I’m also trying to move away from pectins to preserve “true” flavors. I’m fairly confident making jams without it but still rely on the little pink box to ensure the set of a jelly. If I win – please, please, send a jar of the caramel apricot. Or will gladly trade anything from my pantry! I’m making another batch today, just to test the recipe (and because there is not enough now… not nearly enough….) Recipe coming soon, I promise. is pectin’s function primarily that of setting your preserves? is pectin also required to ensure proper safe preservation? I ask because I made some cherry jam, but it ended up pretty loose, even after adding pectin (and cooking down the fruit and sugar for a while.) Even if it didn’t quite set the way it ought to, will it still be safe to put on the shelf and return to months from now? Pectin’s sole function is to set the preserves. (and other foods, but that’s another subject….) Stone fruit jams like cherry and apricot are notoriously difficult to set. Generally, the problem most new jammers have is trusting that the jam needs to cook longer! Try to use the wrinkle or cold plate test if you’re still new to the art. Regardless of the set, it’s perfectly safe for a year from the date of canning, as long as the seal is intact. also jam will set @ 220 degrees. you can get a candt thermometer at walmart for about 4 bucks. I love your blog and learn so much! I am determined to plant a crab apple tree so that I can make the same crab apple jelly my grandmother used to make. So far from our little bitty garden we’ve made a few jars of pickles (hoping for more), and homemade salsa. One day we hope to be able to be one of those vendors in our town’s farmer’s market! Crab apple jelly is another great source of pectin! Having made strawberry, raspberry, and blueberry jams, I think I am ready to venture into stone fruits, so thanks for this post. Can I ask why you add the cracked cherry pits to the macerating fruit? Thanks! The cherry pits add a very light touch of almondy flavor to the finished jam. If it seems like a pain to crack the pits (it is), just add a touch of almond extract. Thank you for this post! I enjoy reading your blog. How cool is Can-it-forward day! I am anxious to start canning for the season. Last year there was very little good fruit at my farmer’s market for making jams and preserves, so I made mosting pickles. Time to start stocking up my pantry with homemade goodies. Thanks for the information on pectin! I’ve just started canning (this will be my 4th season) and I learn something new all the time! I always feel like I’m “cheating” when I use pectin – the “older” ladies at the farmers market always say they don’t use it – they do it the “old fashioned” way. My mom says that they are cooking the flavor out of their fruit and that I should use pectin. Glad to see your article on pectin! I’m now trying to show my son how to can too! I agree. The commercial pectins do require an awful lot of cooking and the fruit ends up tasting so much less sprightly. I actually use the Ball Pectin in my Italian dressing recipe. It gives it that viscous texture so it clings to the salad ingredients. I love this stuff!! This is very helpful. I am fairly new to canning and have only made a few jams but I am concerned about the amount of sugar in them. I still think it’s way better than store bought with HFC though. Thanks for the post and a chance to win this great give away package. What wonderful information – who knew pectin was a fiber!? Thank you! I’ve been using the Ball instant pectin this year instead of processing as I usually do and I have been thrilled with it. I haven’t done NO sugar yet but my last batch (strawberry) I only added 2 tablespoons of honey and it still set like a charm. I’ve been able to catch each fruit as it’s coming along and not have to buy huge amounts, too – cherry, blueberry, raspberry, strawberry – all in my fridge in amounts that will actually get eaten. Obviously to have any left over the winter I’m going to have to do some good old fashioned canning but I am def in love with the “fresh” method. Really great to get all of this good information on pectin. I’ve been making spiced fig preserves with lots of lemon for years, but I’m branching out and finding it hard to discern the right amount of pectin to use. My recent fig/rhubarb preserves using pectin were so thick that I was very nearly tempted to empty the 18 jars, add more liquid, reboil and reprocess. Cooler heads prevailed, luckily! Wondering where other canners acquire interesting labels for their jams and pickles? I recent overcooked a small batch of strawberry jam, came up with a few jars of nearly strawberry leather, they were so thick….does it really work to empty the jars, add more liquid, reboil and reprocess? I hadn’t even considered that I could ‘save’ the jam in that way (I’m fairly new to the jamming world)…. I’ve never had any luck adding more liquid to thick jam. Better to use it as an addition to bbq sauce or filling for cookies or cakes. Good to know, thanks Cathy! In the past I did some preserving using figs – they must be one of the fruits that has a lot of pectin. I think you could probably make pectin out of fig skins that would not have a lot of taste and wouldn’t have the fig seeds either. Just a thought. Someday I may try it! I linked up above to the page on the Ball site that has a pectin calculator. It’s very helpful. Every year I try to put jam up, but living in the Northwest and in Oregon out back we have very little fruit. WHAT we do have is wild plums. HMMMMM very nice for jam and for wine. But thats another story. Thanks for the info on no and low sugar. This is a great post and very helpful! Thank you. oh yippee i love this give away! Every year I put up about two dozen jars of applesauce – I’m thrilled to discover I can use all those cores to make some homemade pectin and not send them directly to the compost! I’m a newbie and very happy to have peaches ripening right now. Yum! It would be so awesome to win this! Our garden is going strong and I have an abundance of produce to deal with! Love this blog! Love your site. I’ve learned a lot about canning. Even though I’m a senior citizen I have just started to can. When I retired we moved to the country. Loving every second of it. I haven’t canned anything before but I really want to try this year. I would love to try rainier cherry perserves! Wow, I never thought about doing my own pectin thanks so much! Neat post & giveaway! I’ve read that one can’t interchange liquid & dry pectins. Is this so? Liquid and dry pectins are added to the jam at different times in the cooking process. I have been looking for a substitute and haven’t been happy with any that I have tried. I cannot wait to try yours out! Thank you for your post. I’ve made fridge pickles, but that’s it! Want to start canning this year, starting with the surplus of tomatoes I’m expecting from the garden. Thanks for your giveaway! I’d love a chance to win one of these…I’m starting to teach friends how to can and preserve. 🙂 Blackberry jelly this weekend! Apple peelings for the win! I love your post very helpful! Love the recipe will have to try this one! i love to can,and recently inherited my grandmothers equipment……lots of vintage gadgets! Hi, What wonderful info. While I’ve been canning now for two years, I’ve never used the lower sugar pectin. I’m happy to hear what the difference is. I never knew. I would love to try it! Thank you for the chance to win your great giveaway! Oh I forgot to ask, what is the hammer in the picture used for? to smash the cherry pits! Awesome giveaway – that jam looks fantastic! Very informative, thank you! I can’t wait to kick my canning into full gear for the season. Your cherry jam looks fantastic! I have used Pomona’s Pectin for several years with good luck, I find that the cloudiness occurs when you use little to no sugar…the sugar is what gives it that nice shine. I just reduce my sugar to taste when I use it, but I always use SOME sugar. Great post about pectin. I love learning about anything canning! I’m hoping to put up some cherries this summer. Thanks for the great information & hooray for awesome giveaways! I just found your blog via Cook.Can.Read and am loving it. I can’t wait to try out the cherry preserves or the raspberry chocolate jam which I am going to make tonight. So excited! I have done very little canning. I am always trying to learn as much as I can. Mostly from the grandmothers in my family. Very informational post here. Thanks! This is great, thank you! I’d been steering clear of jams because of the sugar content. A friend and I started canning last year and we love it! We have already made several batches of strawberry and cherry jams (oh and a batch of raspberry!). Cherry is one of my favorites I will definitely be celebrating can-it-forward this year and handing out some jams! Great post! I use Sure-Jell low sugar pectin and sometimes even no pectin…but I have ben a bit confused by all of the various choices so this was very interesting. Thank you. I’ve just started canning and love it. Can’t wait to do more! Made tomato jam this weekend, yummy! I think strawberry rhubarb is next. Wonderfully informative as always! Thanks so much! Thanks for this great post- I just shared it on Facebook and with my other canning friends! After spending winter using a can openner I am ready to capture & can this season’s bounty! I always appreciate a refresher course before starting. Your site is always inspiring & what a great idea of Canning Forward! I love to can with my girlfriends & enjoy the new idea’s & recipes everyone brings with them. I am marking the date on my calendar ! Thank you again. Plain and simple. I want to win this, Cathy. You KNOW what a can-a-phobe I am, and this kit could be just the push into the deep end [of the jam pot] that I need! I’ve just started getting into making jams and am pretty unclear on the different types of pectins and their fruit to sugar ratios. Thanks for this explanation, it’s quite helpful. I’ll be checking your site regularly from now on! As a kid, I didn’t even know what store bought jam tasted like! My mom had two things she preserved every year: apricot jam (we lived in a tract built on a former orchard in San Jose) and dill pickles. With mom in mind, I “put up” at least one batch of jam and a lug of “cukes” each season. I found your blog through Punk Domestics, and the pectin info is great! Thanks. I think for can it forward I will do strawberry since cherries are out of season in my area. Thank you for the helpful information about pectin. It’s good to know there is a type that uses less sugar, and that I can make my own as well. thanks for the interesting post. i usually go for no pectin and am happy with a looser jam, but i just tried pomona yesterday. i really want to try making the apple pectin! i love this idea. Thank you for so much information. I am a beginner canner and was kind of stumped when shopping for pectin! I would love to win the canning things, it would be so helpful. Love this post! I’ve been meaning to research this very topic and here it is! Thanks so much! I am very excited to get canning this summer, I feel I am so behind. I definitely did not make enough jam last year and I didn’t use pectin. I’d be interested in trying with pectin this year!! Hope everyone has a wonderful can it forward day!! i prefer using pectin for berry jams. I just think they lose something the longer they cook. Especially strawberry jam. Recently, I’ve fallen in love with Pomona to do this. Thanks for the info. I love making jams but I really hate adding that much sugar. I can’t wait to try jam with homemade pectin. Just started canning last week! Very excited for the summer fruits and veggies to appear! I love enabling! I call myself the Can-vangelist. I tried Pomona’s a couple of times unsuccessfully. Making one’s own pectin is quite labor intensive but I would like to make it work. I am off to Hood River to pick cherries tomorrow! Thanks for such a timely post. Wow awesome now I need to figure out what I want to can! Started with jams, then brandied peaches, salsas now totally hooked! haha It is a practical art so it fits me perfectly. Thanks for having the giveaway. Think I’ll invite a couple of people over to make a jam. Most of the people here haven’t done this before and some even want to learn how. Of course, they really appreciate the jams and jellies and pickles I give them as gifts! I would love to can some Chutney! Thanks for this post. I am just getting into canning. This will be a fun adventure as I follow in my grandmothers footsteps. This post made me reminisce about my childhood- when the jam didn’t set it amazingly became syrup for ice cream! It was delicious either wat! Great explanation of pectin! I have used all but homemade and would love to try it. I have an apple tree that never has enough energy to ripen it’s fruit before they fall and rot. Can I use these? And how unripe? I am hoping to have my first canning party. Thanks again. Thank you for the great information. I have never canned before but am planning to try. This clears up a lot of questions I had, thanks! Looking forward to trying my hand at making homemade pectin. this is a great idea and a great prize. I am a newbie canner on my own. I always used to can with my MIL, but this year she hasn’t had as much time to do it with me so I have been on my own. Always love new resources (and less sugar). Thanks for the info. Oh, and I hope to teach someone else this year, so I would love to win! i’m a novice canner with high hopes of more. thank you for the advice! 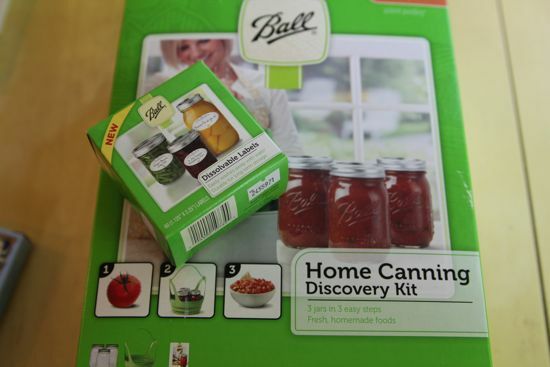 would love the ball canning kit. always love canning jars!!! So, if I make apple stock, can I can it and use it for pectin later? I just made apricot jam. Needless to say I love that I did not have to peel. Please pass along your best recipe for doing up plums. Continue to love you. Still waiting for fruit to be totally ripe up here in the PNW… Thanks for the advice as always! I have been using Ball’s low sugar pectin but instead of fruit juice I use water (I agree that juice does change the taste of the jam and depending on the fruit, makes it into something else). I also find that if I cut back on the recommended amount of pectin and cook the fruit and water for a bit the mixture thickens up nicely, the set is good, and the flavor is all fruit without too much sugar and without tasting watery. BUT there is definitely a bit of fiddling involved and I do check the set using the cold plate method. I have also read that you can activate the Ball Low sugar in a separate pan of water for those times when you need to macerate the fruit with the sugar for a period of time – but I have not tried this yet. Thanks for the great info. Thank you so much for the information and links above! I look forward to learning more! I have started to purchase the jars of pectin and enjoy the flexibility they offer. I am looking forward to canning fruits and jams this year. I have only pickled in the past and am ready to try my hand with something different. Thanks for the post. I have a sour cherry tree in my back yard and only recently posted my sour cherry jam. It takes a lot of tweaking to get actual cherries in the jam, and not just whole lotta syrup, but the flavour of the Evans Cherry is outrageous and so worth every effort. Thank you for the great review! I just had a canning party last night, hoping for more. Looking for those sour cherries, too. Thanks for the great info! I tried some Pomona pectin for the first time and while I can’t speak to the cloudiness, since it was Peach, Thyme and Black Pepper jam, it did set well. The two part process was a little confusing the first time. I’m looking forward to making my own pectin in the fall! Great information. I love to can my own foods!! Getting my veggies and fruits from Bountiful Baskets on Saturday..and this week there will be a box of Washington State Cherries!! I’m looking forward to making some preserves with them. 🙂 Thanks for the great information. As usual a great post. Have now made Mango Chutney, and Marmalades. Perhaps when tomatoes are ready I’ll can some. H Hard to store the jars in an apartment kitchen, though I probably have more storage than most. Would very much like to have your directions on making pectin. Thanks for the reminder about Can-It-Forward day. I think a trip to the orchard for peaches and a canning day is in order! I too was sad that tart cherries went so quickly this year. I managed to get enough PYO at Rock Hill to make a cobbler, but not much else. This will be 2 years in a row for me with no sour cherry jam. 🙁 I am still using the commercial pectins, but will check back through your archives to see about making my own! great post! i hope to try making my own pectin this year, too! love your blog. 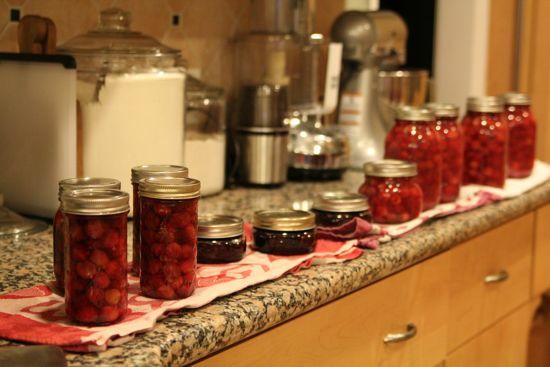 I’ve been canning since I was a little girl with my grandmother, but there is always more to learn! I would love to win this especially anything that you have made! I’m so into canning…I would have never thought I could do it – and today I’m making blueberry jam!! I love your blog! I went on one internet hunt to find a recipe and instead found your blog and a couple others I’ve started following. I’ve done limited canning but living in the PNW there is so much I could can that my fingers have been itching to try again! Live your recipes! I pickled some tomolives for the 4th & can’t wait to give them a try. Also, I made ketchup from a recipe you posted & it has been a hit. Thanks! I can’t wait to try some of the preserve recipes this year. We’re very fortunate to have a tart cherry tree in the backyard. The cherries are tiny, but have excellent flavor. Now that I’m a canner (this is my third year) I can make much better use of the cherries from the bottom half of the tree. The birds still get the ones on top, though. 🙂 Thanks for the tips! I just made my first batch of Cherry Jam following Christine Ferber’s recipe. She called for 7 oz.of Green Apple Jelly (which I made earlier). I boiled and boiled and it did not set up as thick as I’d like, but I was afraid of scorching it. I added a tablespoon of Creme de Cassis for good measure;) Although it is a bit on the runny side I found it quite delicious over homemade vanilla ice cream sitting on a slice of Sarabeth’s Orange Cake! I was happy to read it may set up more with time. Do you think the 7oz of Apple jelly was too much? Thanks for this! My roommate and I have been looking into canning once the local summer fruit really gets going, and we weren’t sure which pectin to use. I love all your canning posts because I, too, love to can. I love all things that are home-canned, from the jellies to the pickles to the chutneys to tomatoes. My cherry tree is full at the moment but the cherries are not ripe yet (too much clouds and rains – I think we’re the only part of the country that is cold and wet). I have some red currants on their way, the plums are still tiny green, and the Bosc pears are plentiful. Oh, and apples! My crab apple provides the best jelly! I also love rose petal jelly but the deer snuck in to my garden and robbed me! Thank you for inspiring me to do some canning this week! I have gooseberry jelly which has sugar in it. Do you think I could use it for pectin? I may just try it with my surplus of cherries…. I’m sure your gooseberry jelly would provide the pectin boost you need for the cherries. 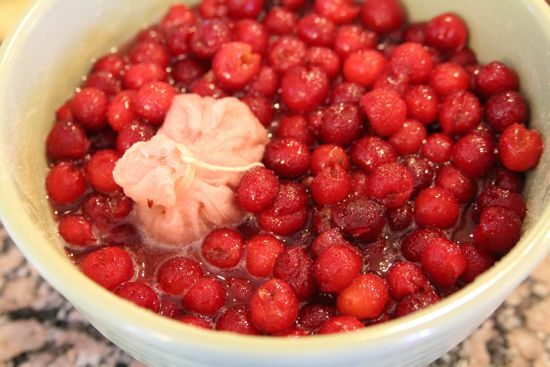 Just modify the sugar you add to the cherries a bit, or the end product will be too sweet. Do you think this recipe would work with no pectin at all? I made your cherry-apricot preserves last summer with great success, and was hoping to adapt to cherry only–but don’t have any homemade pectin on hand. I’m so excited! Can’t wait to try making my own pectin! I made cherry jam as well this year, so beautiful and tasty! Love all your posts and all your knowledge that you share. I’m a fairly new jam maker and have only used pectin with pomegranate other times I’ve just used lemons without excess lemon flavor. I know my Mom has the apple pectin recipe highlighted in her Ball book that I now have! I will have to give it a try. Thanks for the info. couldn’ agree more, especially about cloudy results with pomona. thanks for the informative post. Thanks so much. You’ve ansered a lot of my questions. 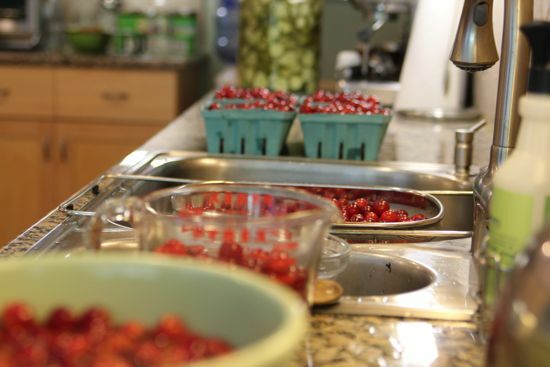 My dad has been making tart cherry preserves for the past 25 years… we used to get paid a penny a pit to help with the prep! I’m a big Pomona fan myself, though I’ve never tried it for something like a jelly that needed to be perfectly clear. Happy Can It Forward! Wow—pectins. This is one of those posts where you realize you didn’t even know enough to formulate a question prior to reading about it! Learning more, slowly but surely. Just saw the Ball low or no sugar pectin in the store yesterday and was wondering about it. I have never really understood pectin and its purpose. Thank you for the timely post!!!! Have a safe and great 4th!!!! Thamks for clearing up some of my pectin questions!! Last year I made a batch of cherry lime jam, and I grated a green apple into it. The flavors absolutely overpowered any taste of apple, and the jam actually got too thick. So this year I used only half an apple, and it was pretty much just right. For my white nectarine jam, I used the technique suggested in “Canning for a New Generation”: I peeled and quartered my green apple, and wrapped the peels and core in cheesecloth. Then when I reduced the syrup the fruit and sugar let out, I boiled the apple and peels in there. They gave enough pectin to the mix that I could fish them out and put the whole thing together before I boiled away the lovely pink color. Yay! Another thing about commercial pectin: it is derived from fruit, but by a process using industrial chemicals, and it’s not all that “natural”, even the Pomona. Just sayin’. At church this year we put in a large garden to help people out that just need a little help and some local food banks. We will be teaching a bread making class and currently trying to set up a canning class. I love to can. Sadly, this past weekends storms leveled my tomato plants but I still plan to enter the fair. These items would be a great help. Thanks for the contest and I will be checking back more often for recipes. Wow what a great give away. I am in a time bank where we share skills & resources. This would go a long way shared with others. Very interesting posting. I’d love to cut down the amount of sugar in my jams. My results have been inconsistent; blueberry jam set perfectly but strawberry has been a little too runny. I think I’ll try the new Ball pectins. Thanks! Just started canning today and I am inspired by your site. I am excited to do some more canning, especially on National Canning Day!! I learned to can from my French-Canadian mother-in-law. She gave me all of her jars when she decided it was too much work! My great grandfather in St. Louis was in the canning jar business and I still have some of his original glass jars that go under the “Drey” name….he eventually sold out to the Ball company. I would love to receive this gift to put up preserves from berries in my new garden this year! Thanks. I can’t wait to try making pectin from apple or choke cherries. I just bought five acres on an island in the PNW and am looking forward to planting my orchard this fall. I already have my berried patch planted with raspberries, blueberries and grapes. I love this website. Always great things to learn about food basics. Love your website! I’ve made a few things from your site. A recurring recipe I make is your Corny Waffles. I love the crunch! What a nice contest. Thanks! I just found your lovely site! I love canning and pickling, and will have to try this recipe. Thanks! This is my first year of canning and so far I’m loving it! Instead of the hot water bath method, I use the oven method I learned at a jam class a few years ago and so far no one’s gotten sick from eating my jam. I’ve also played around with packaged and natural pectin and prefer the taste of the natural, mainly Meyer lemon rinds. The cherry and blueberry batches I’ve made set well but the strawberry lime jam was loose but not so loose that friends didn’t gobble it up. can with my daughters like I did w/ my Mom. so much fun ! Thank you for the chance! I learn something every time I read an entry. Great information on pectin, thanks! Just diagnosed as a diabetic, so learning about the low sugar/no sugar is helpful. You never cease to teach me something new in a blog post, Cathy! I made pickles for the first time last weekend and definitely want to try my hand at some preserves this weekend. I just started canning recently, and really appreciate the information on your site. Thanks for the pectin tutorial! I just found your blog, I have spent an hour reading back posts and cann’t wait to try some of your recipes. Thanks for the chance at the giveaway. I love your website and can’t wait to start the canner- I am behind. I shared my first efforts at canning (strawberry preserves) with friends and received thumbs up!!! This weekend will be peach preserves and I think your 7 day pickle recipe is an absolute must. What fun! Thank you! So happy to hear that fact about how our bodies absorb pectin – I definitely have a more compelling reason to eat them now! In a couple of instances, yes, the pomona was much stiffer than I wanted. It takes finesse, I’m convinced, to use it properly. Two of my students who make quite a lot no-sugar and honey only jams really like using it. Wonderful information re: pectin. I’m off to buy some sour cherries and get started. 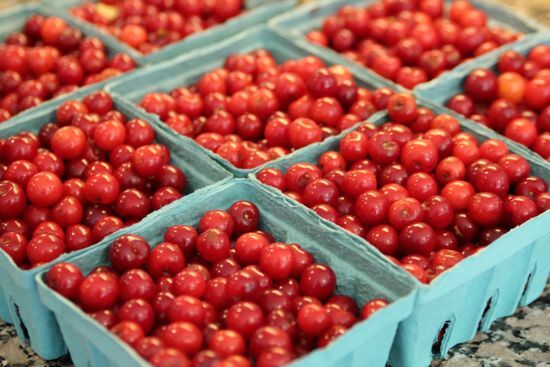 Cathy– I had made jam with many different fruits for years, but hadn’t made sour cherry until I moved to DC in 1996. I was disappointed in my first efforts because despite using Sure-Jell pectin, the jams were syrupy, and I didn’t like the ratio of fruit in the jar. Not enough cherries. I’ve also tried making jam without pectin and found that I didn’t care for the overly dark color and overcooked flavor. 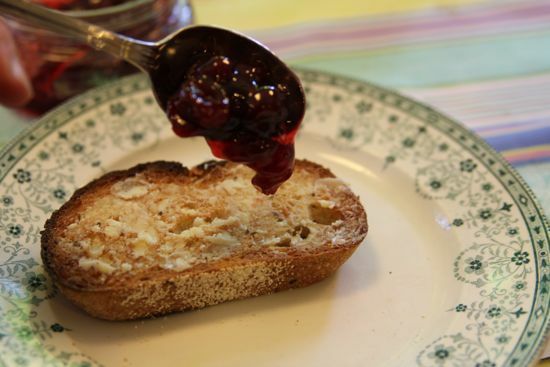 I have developed my own method over the years that I have been making sour cherry jam, which results in a very pleasing jam, chock-full of fruit. 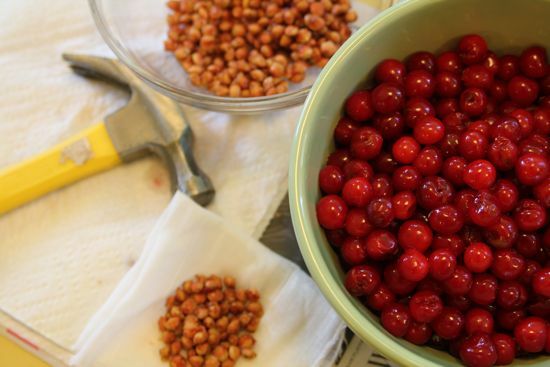 It’s quite a simple technique–I pit the cherries, chop them lightly and drain them well–they are usually very juicy. Then I reduce the juice by 1/2 to 2/3. That really concentrates the flavor. I don’t like super-sweet jam, so I add sugar in the amount of about 1/2 the volume of fruit. And it doesn’t take a lot of pectin to set it. I add a little bit of almond extract instead of smashed cherry pits. By the way, I found powdered apple pectin at Surfas, a gourmet chef/kitchen supply store in Culver City, CA. They do online sales at http://www.surfas.com– it’s a great resource. I have a plum tree that’s begging for it! Very intersting post. And your preserves look delicious! My mom taught me to use citrus seeds to make natural pectin. I started canning about 20 years ago and became obsessed. Jam, fruit, pickles, compotes, whatever. Not quite as fanatic as I once was but just got a ton of cherries so jam is on the horizon. Great article. I made red raspberry jam last week, apricot-pineapple jam yesterday and today it’s cherry jam! My family loves my homemade jam and I love to make it for them. I buy my pectin in bulk pakages at the local Amish store. I don’t use pectin for any jams (raspberry included). I only use it in my chokeberry jelly, and my savory jams that obviously don’t have natural pectin (horseradish, ginger and roasted garlic). I have a lot of fruit on my property, so it became too expensive to continue the use of pectin. Discovered the Blue Chair Jam Cookbook a couple of years ago; author Rachel Saunders never uses pectin. She uses quite a bit of sugar, but I try to use a bit less, but you do need it in order to thicken the jam. come back in the future. I want to encourage you continue your great job, have a nice weekend! Thank you for this! I only had a dab of local cherries that I’d frozen last year, but wanted to make cherry jam out of it. After reading your article, I threw the cherries, a little water, some white sugar to taste, a splash of bottled lemon juice, and a quartered Granny Smith apple in the pot and cranked the heat up. It didn’t take long for it to get to about 212 before I called it — it was already pretty thickened by then. I put the cherry jam in a half pint jar and into the fridge (it won’t last long enough to water bath it! ), and the apple went into another container to eat later tonight. When I get time, I’m going to make your apple pectin and freeze it for use this summer as I can jams, preserves and jellies. No cherries down here but I found some tart bottled cherry juice. Can I make Jelly from that? You’ll need pectin, but sure!